Choose a large container, with good drainage holes. Bigger containers means bigger, better roses! Roses in larger containers will also over-winter far better than roses in small pots. Use a good commercial potting mix such as pro mix or blend your own rich but fast-draining potting soil. Avoid using large amounts of ordinary garden soil in pots. During winter, store containerized roses in a protected spot, out of the winter winds and heavy rains. Under large trees or in protected areas on the patio are great locations. ( remember to give them some water if they get too dry undercover!) For areas that get winter temperatures below -15ºC for extended periods of time, bury the pots in the ground or take them into a greenhouse or storage shed for winter. They love a cold resting period, but not prolonged periods of deep freezing. In spring, remove the top three inches of soil from around the rose and replace it (topdress) with nice compost or a well-rotted manure blended with peat moss or good garden soil. Add a small amount of granluar fertilizer afterwards. Choosing a Container: The container you use can vary with each type of rose, but all containers must have one thing in common: drainage holes. Be creative with deciding what type of container you want to grow your rose in. Containers used can include wood, traditional clay, ceramic and of course plastic pots. Use big containers! They are far more forgiving when it comes to watering and overfeeding! Rule of thumb: Use a half oak barrel size for roses such as hybrid teas, climbers or shrubs. For mini roses, use at the very minimum a 2 gallon pot, the larger the pot the happier the rose. Having said that, the easiest roses to grow in containers are landscape roses, smaller floribundas and shrub roses, compact hardy varieties on their own roots, or any of the miniatures, climbing or otherwise. It’s beneficial to repot every 2-3 years to refresh the soil and root prune if you’re trying to keep the plant smaller. Also, if you notice decreased bloom, it’s time to transplant to a larger container. The Right Soil Mix: When filling pots, use a well-aerated but moisture retentive mix. Commercial peat-based mixes like pro mix work well in combination with some compost or garden soil. Experiment a bit to find the mix that works for you. Garden soil is not recommended, it can be heavy and compress with frequent watering, or dry out too fast. If you already have a favourite potting mix, try it on your the roses. Make sure that it drains well. Extra perilite, fir bark mulch or fine bark chips is a great way to help your soil drain. Fertilizing: The amount and frequency of fertilizer is directly influenced by the amount of watering done. A rose grown in a small container that is watered daily will require a steady supply of nutrients to replace all that is lost through leaching. Liquid sea kelp or liquid fish fertilizer can also be used at half strength in conjunction with a granular fertilizer that was applied in spring. Feed through the summer every two to three weeks depending on how fast the rose is growing to give them a boost. Watering: If you want to grow great roses, keeping an eye on them is a must. Daily watering in hot weather may be required. Use the largest container possible as they will not be so prone to drying out. During periods of extremely hot weather, move smaller pots to cooler areas with no less than three hours of direct sun. The roses will be fine in a shady area for a temporary period and the blooms will last much longer. Move them back into the sun when things cool off. Try cluster pots together so the outer ones will keep the root area of the inner pots cooler. Roses are not big on hot roots so tiny containers on hot decks are not a great plan. Pest Control: Container roses can easily be examined for damaged or off-colour leaves. Check them frequently to avoid buildup of pests. Any insects found on the plant may be hosed off with a strong blast of water. Splashing water under the leaves helps to prevent spider mites and contrary to common belief, water on the leaves will inhibit the growth of powdery mildew. Fungicides like the Organic bio-fungicide Natria can be applied if the black spot or mildew problem is severe. For large insect invasions like aphids, try wiping them off the stems and the buds where they like to congregate. Rose worms or small caterpillars can be squished, just wear gloves, it’s very therapeutic. If all else fails, low toxicity insecticides are available to buy. 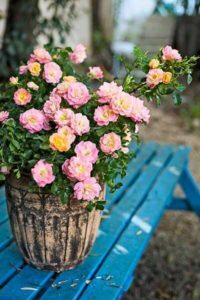 Mixed containers: Roses seem to grow best alone in containers, but if you wish to plant small spring bulbs or annuals in the containers then go ahead and experiment. 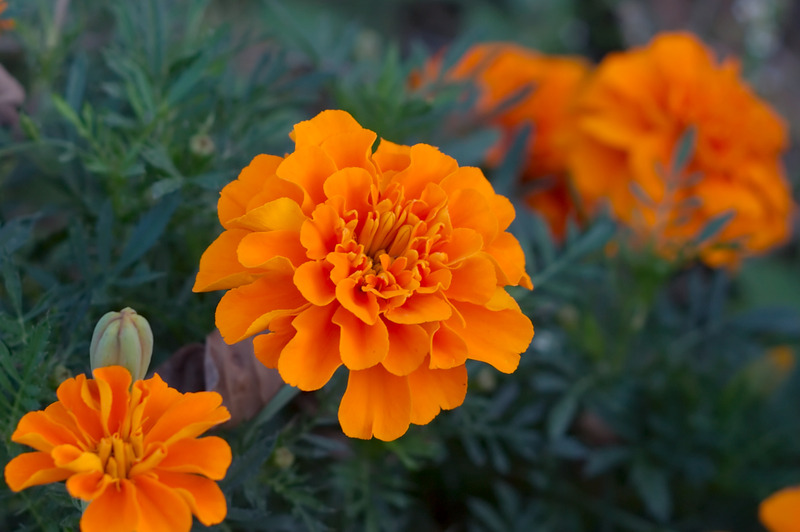 Try planting Tagetes Marigolds, they do double duty, they are colourful and are said to repel aphids. Chives and ornamental alliums are said to repel black spot, increase perfume, and also ward off aphids. Once the rose leafs out and starts to put on a show, it is advisable to trim back any other plant that may be crowding it. Make sure also that the roots of these plants do not compete with the roots of your roses. If you’re not sure if the combination will work, just try it and see what happens. If your rose isn’t happy, it will tell you. One last thought- keep your drainage holes working, they are no good if they are plugged up with roots or compacted soil.